When you need to collaborate with others on a project that involves word processing, spreadsheets, and/or presentations, Google Docs is an excellent solution: the ability to work with others in real time is something that’s hard, if not impossible, to replicate in any desktop program. But once you get beyond collaboration, there are very few reasons—other than “it’s free!”—to use Google’s online suite. What’s so bad about Google Docs that I can’t recommend it for general use? There are any number of things that make it inferior to just about any OS X-based alternative, but I’ll focus on five main problem areas. Google Docs is not actually a suite of applications. It’s a set of Web pages that are displayed by your Web browser. As such, its abilities are limited to the capabilities of your browser. This is actually the root of some of the other problems I’ll cover below; the browser simply can’t do it any other way. Working in a browser restricts you in ways that native applications don’t. Want to open two documents side by side? Sure, you could do it by opening two browser windows. But that means having two copies of your browser environment open at the same time—and neither window will know about the other, except through the browser’s own menus. Playing a Flash game in one browser tab while working on a presentation in another? Better hope the Flash plug-in doesn’t crash and bring down your entire browser. If it does, you’ll have to reopen all your Google Docs windows again, and hope your work was auto-saved in time. Because all your Google apps are actually running in one app (your browser), you can’t Command-Tab directly to a spreadsheet or document window; instead, you have to navigate to your browser, then find the right windows. If you’re both browsing the Web and working in Google Docs, make sure you open your Google Docs files in separate windows, not tabs. Otherwise, you might accidentally close whatever you’re working on if you close all your open tabs. The browser is a wonderful invention—for browsing the Web. It’s a terrible replacement for a well-written standalone application. Look closely: Because of their plain fonts and lack of shadow, Google Docs menus can be hard to pick out. Use any of the Google Docs apps (Document, Presentation, or Spreadsheet), and you’ll know within a second of opening it that you’re not using a real OS X application. Not only does the Google suite look different, it behaves differently too, and not in a good way. Menu titles on what would be the menubar are rendered in a plain text font, making them hard to distinguish from the rest of the Google Docs interface. Once you find that menubar, clicking on one of its entries does indeed produce a menu—but, again, its text is hard to distinguish from the background. And because that menu lacks shadows, it blends into the page you’re working on. If an entry on a Google Docs menu has a sub-menu, you need to hover your mouse over the top-level entry for a second before the sub-menu appears. If you then move the mouse too far, the sub-menu may vanish. Below the menu bar, a row of icons appears in a toolbar. But you can’t customize that toolbar, nor can you move or resize it. There aren’t any floating palettes; everything is done via the menus, the tool bar, or what can be a huge contextual menu that appears when you Control-click. Creating a chart in the Spreadsheet app requires first picking a chart type from a long scrolling pop-up box, then tediously filling out a form. Editing formulas is done in the cell, which isn’t necessarily bad. But if the formula is too long, it wraps, which makes it hard to edit. I could go on, but you get the idea: Even the worst OS X application has a more visually appealing and easier to use interface than Google Docs. If you can get past the interface (which, really, I can’t), you’ll find that Google Docs lacks features you’d expect in an OS X program. Compared to a desktop program's, Google Docs' font selection is ludicrously limited. How about fonts? 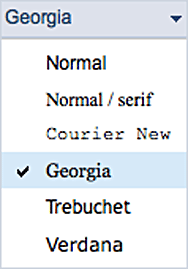 As long as you like Georgia, Trebuchet, Verdana, Courier, or Normal, you’ll be thrilled with Google Docs. (Document offers another seven fonts, such as Comic Sans and three versions of Arial.) Beyond the stock fonts, though, there’s no way to use other fonts. Want to create a presentation? There are only 15 themes, and there’s absolutely no support for animation (moving objects) or builds (layering elements onto your slide over time). You can’t specify the target resolution of your presentation, nor create transitions between slides. But hey, at least you’ve got all those fonts to work with. Assuming you’re using OS X 10.5, and you have installed Google Gears, you can view but not edit Presentation and Spreadsheet files; you can edit Document files. Given the hassles of working offline, it’s better to just use the File -> Download As menu to create a copy of your file. You can then edit it offline and upload it when you’re back online. Just make sure you don’t use any features (multiple columns) that aren’t supported by Google Docs. 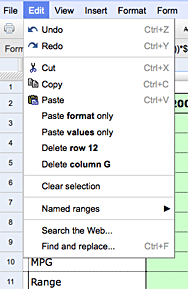 The Google Docs print dialog gives you few options and little control over output. Printing is definitely not one of Google Docs’ strengths. 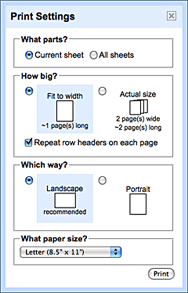 Choose Print in Presentation or Spreadsheet, and a near-useless print dialog appears. Click Print and…a PDF is downloaded to your Mac! In Document, it’s even worse; the PDF just appears, without any dialog. Compare that to the Print dialog in any Mac application, in which you’re given control over not only the printer and its settings, but also any number of options for controlling the output. The other problem with printing from Google Docs is that it’s not really WYSIWYG; it’s more like WYSISLWYMG—what you see is somewhat like what you might get. That’s because there aren’t any page-view modes in Google Docs. Until you print, you don’t know what you’ll get. Google Docs satisfies one need very well: it’s the suite to use if you have a bunch of people who need to work on files at the same time (or repeatedly over time). With centralized storage, change-tracking, and easy sharing, Google Docs fills that niche perfectly. But for basically any other need, I think a pure desktop application is better. Even a program as simple as TextEdit can do more than Google Apps’ Document. And there’s just no comparison between Google Docs and either iWork or Microsoft Office. Those native applications give you more features, better interfaces, and superior integration with the OS.